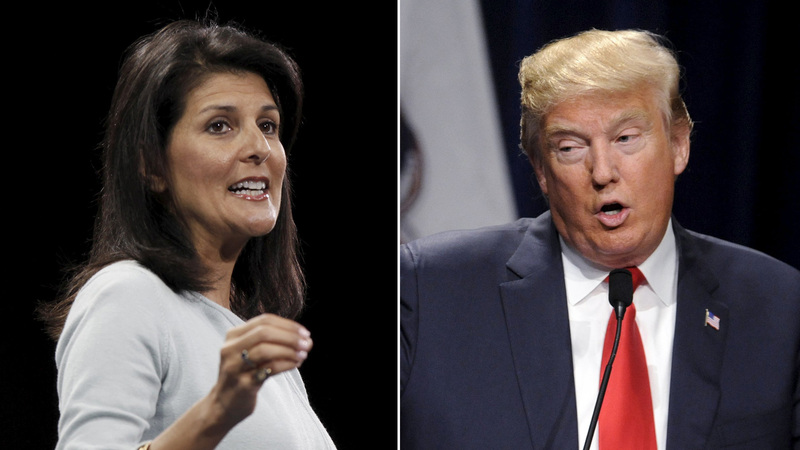 Donald Trump is leveling a new wave of attacks at Nikki Haley, after the South Carolina governor warned Republicans away from heeding "the siren call of the angriest voices" during her response to President Obama's final State of the Union address. In an interview with Fox News early Wednesday, Trump lambasted Haley for being "very weak on illegal immigration," and he complained that "she certainly has no trouble asking me for campaign contributions." "Over the years she's asked me for a hell of a lot of money in campaign contributions," Trump said. "So, you know, it's sort of interesting to hear her." He further dismissed the chances of Haley rising to the Republican ticket as vice president, saying that the South Carolina governor is "not off to a good start" and that whoever he picks will be "very strong on illegal immigration." On Tuesday night, Haley delivered the GOP response to the president's annual address, in which she criticized not just Democrats, but also her own party. In the speech, she also laid out a more compassionate view of immigrants in the United States. "Today, we live in a time of threats like few others in recent memory. During anxious times, it can be tempting to follow the siren call of the angriest voices. We must resist that temptation," Haley said in her televised speech. "No one who is willing to work hard, abide by our laws, and love our traditions should ever feel unwelcome in this country." She added that Republicans "need to recognize our contributions to the erosion of the public trust in America's leadership. We need to accept that we've played a role in how and why our government is broken. And then we need to fix it." After the speech -- which many viewed as a direct response to some of Trump's bombastic rhetoric on the campaign trail -- conservatives like radio host Laura Ingraham were quick to call Haley's response "not smart." But on Wednesday, the South Carolina governor told "CBS This Morning" that she "wasn't trying to please everyone" with her address. "I was also critical about our own Republicans and that's because we can't assume that we have no blame here," Haley said. "It's healthy when you can point out certain things that you feel like weren't in the best interest of your state or country...it's very important to get ego out of the room." In an interview with ABC News, Haley added that "Mr. Trump has definitely contributed to what I think is just irresponsible talk." Still, some in the Republican party applauded her criticisms of the GOP. Presidential hopeful and former Florida Gov. Jeb Bush called Haley's remarks "spectacular" and said of her South Carolina governorship that "she's done an extraordinary job." "I just think the culture in Washington needs to change. and a reform-minded governor like Nikki Haley understands that," Bush said in an interview on Fox News. "Look, we're in a divisive world. I thought her speech was unifying and purposeful. I thought she did a phenomenal job. It's so hard to do that when you're competing with the president of the United States." Bush also said, "I don't know what the threat -- if she was, if it was a veiled threat to Donald Trump or not -- but the simple fact is the louder voices in our party need to be focused on what unites us and what unites Americans." "I think it's really important for us as conservatives to have a hopeful optimistic message, to lay out detailed plans to fix the things that are broken in Washington, D.C., not to prey on people's legitimate angst and fears," he said. New Jersey Gov. Chris Christie praised Haley's "phenomenal job" on the response. "She's smart, she's direct and her answers this morning showed that she's direct," Christie said after a roundtable discussion in New Hampshire. "She didn't try to hide what she was saying and she's got concerns about tone, she's going to express them and I think that's great." Speaking with Fox News, Christie also hit the president for his lengthy address, saying Mr. Obama was living in a "fantasy land" and his State of the Union speech proved it. "I've read more true, you know, fiction books to my kids putting them to bed at night than he gave in that speech last night," Christie said Wednesday. "You would think the world was a beautiful, wonderful place. But it isn't right now. It's a dark and dangerous place because of his weakness, which has led to American weakness around the world." Late Tuesday night on Fox News' "The Kelly File," Texas Sen. Ted Cruz similarly billed Mr. Obama's address as a "state of denial." "It shows how out of touch Barack Obama is with this country," Cruz said.